Indicate by check mark if disclosure of delinquent filers pursuant to Item 405 of Regulation S-K is not contained herein, and will not be contained, to the best of the registrant's knowledge, in definitive proxy or information statements incorporated by reference in Part III of this Form 10-K or any amendment to this Form 10-K [ √ ]. Indicate by check mark whether the registrant is a large accelerated filer, an accelerated filer, a non-accelerated filer, or a smaller reporting company (as defined in Rule 12b-2 of the Exchange Act). At December 30, 2011, the last business day of the registrant’s second fiscal quarter, the aggregate market value of the common stock held by non-affiliates of the registrant was $313,655,596. Determination of stock ownership by affiliates was made solely for the purpose of responding to this requirement and registrant is not bound by this determination for any other purpose. At August 17, 2012, the registrant had 11,404,246 shares of its common stock outstanding. As permitted by Securities and Exchange Commission regulations, the Interactive Data File for this Annual Report on Form 10-K will be filed within the 30-day grace period for the first financial statements required to include detailed tagging of notes to the financial statements and financial statement schedules. Portions of the Proxy Statement for the Annual Meeting of Shareholders to be held October 19, 2012, which will be filed pursuant to Regulation 14A not later than 120 days after the end of the fiscal year covered by this report, are incorporated by reference into Part III. Market for the Registrant’s Common Stock and Related Stockholder Matters. Change In and Disagreements With Accountants on Accounting and Financial Disclosure. Directors and Executive Officers of the Registrant. Security Ownership of Certain Beneficial Owners and Management. Certain Relationships and Related Transactions, Director Independence. Twin Disc was incorporated under the laws of the state of Wisconsin in 1918. Twin Disc designs, manufactures and sells marine and heavy duty off-highway power transmission equipment. Products offered include: marine transmissions, surface drives, propellers and boat management systems as well as power-shift transmissions, hydraulic torque converters, power take-offs, industrial clutches and controls systems. The Company sells its products to customers primarily in the pleasure craft, commercial and military marine markets as well as in the energy and natural resources, government and industrial markets. The Company's worldwide sales to both domestic and foreign customers are transacted through a direct sales force and a distributor network. The products described above have accounted for more than 90% of revenues in each of the last three fiscal years. Most of the Company's products are machined from cast iron, forgings, cast aluminum and bar steel which generally are available from multiple sources and which are believed to be in adequate supply. The Company has pursued a policy of applying for patents in both the United States and certain foreign countries on inventions made in the course of its development work for which commercial applications are considered probable. The Company regards its patents collectively as important but does not consider its business dependent upon any one of such patents. The business is not considered to be seasonal except to the extent that employee vacations are taken mainly in the months of July and August, curtailing production during that period. The Company's products receive direct widespread competition, including from divisions of other larger independent manufacturers. The Company also competes for business with parts manufacturing divisions of some of its major customers. Primary competitive factors for the Company’s products are performance, price, service and availability. The Company’s top ten customers accounted for approximately 49% of the Company's consolidated net sales during the year ended June 30, 2012. There were no customers that accounted for 10% or more of consolidated net sales in fiscal 2012. Unfilled open orders for the next six months of $98,746,000 at June 30, 2012 compares to $146,899,000 at June 30, 2011. The Company saw a decline in orders by oil and gas customers for its 8500 series transmission as current demand has softened for new high-horsepower rigs due to the North American natural gas supply overhang and lower prices. In addition, the Company has begun to accept orders and has shipped initial units of its new 7500 series transmission for the oil and gas market. Since orders are subject to cancellation and rescheduling by the customer, the six-month order backlog is considered more representative of operating conditions than total backlog. However, as procurement and manufacturing "lead times" change, the backlog will increase or decrease, and thus it does not necessarily provide a valid indicator of the shipping rate. Cancellations are generally the result of rescheduling activity and do not represent a material change in backlog. Management recognizes that there are attendant risks that foreign governments may place restrictions on dividend payments and other movements of money, but these risks are considered minimal due to the political relations the United States maintains with the countries in which the Company operates or the relatively low investment within individual countries. No material portion of the Company’s business is subject to renegotiation of profits or termination of contracts at the election of the Government. fiscal 2012, 2011 and 2010, respectively. Compliance with federal, state and local provisions regulating the discharge of materials into the environment, or otherwise relating to the protection of the environment, is not anticipated to have a material effect on capital expenditures, earnings or the competitive position of the Company. The number of persons employed by the Company at June 30, 2012 was 1,029. A summary of financial data by segment and geographic area for the years ended June 30, 2012, 2011 and 2010 appears in Note J to the consolidated financial statements. The Company’s internet website address is www.twindisc.com. The Company makes available free of charge (other than an investor’s own internet access charges) through its website the Company’s Annual Report on Form 10-K, quarterly reports on Form 10-Q and current reports on Form 8-K, and amendments to those reports, as soon as reasonably practicable after it electronically files such material with, or furnishes such material to, the United States Securities and Exchange Commission. In addition, the Company makes available, through its website, important corporate governance materials. This information is also available from the Company upon request. The Company is not including the information contained on or available through its website as a part of, or incorporating such information by reference into, this Annual Report on Form 10-K. The Company’s business involves risk. The following information about these risks should be considered carefully together with other information contained in this report. The risks described below are not the only risks the Company faces. Additional risks not currently known, deemed immaterial or that could apply to any issuer may also result in adverse results for the Company’s business. As a global company, we are subject to currency fluctuations and any significant movement between the U.S. Dollar and the Euro, in particular, could have an adverse effect on our profitability. Although the Company’s financial results are reported in U.S. Dollars, a significant portion of our sales and operating costs are realized in Euros and other foreign currencies. The Company’s profitability is affected by movements of the U.S. Dollar against the Euro and the other currencies in which we generate revenues and incur expenses. Significant long-term fluctuations in relative currency values, in particular a significant change in the relative values of the U.S. Dollar or Euro, could have an adverse effect on our profitability and financial condition. Certain of the Company’s products are directly or indirectly used in oil exploration and oil drilling, and are thus dependent upon the strength of those markets and oil prices. In recent years, the Company has seen a significant growth in the sales of its products that are used in oil and energy related markets. The growth in these markets has been spurred by the rise in oil prices and the global demand for oil. In addition, there has been a substantial increase in capital investment by companies in these markets. In fiscal 2009, a significant decrease in oil prices, the demand for oil and capital investment in the oil and energy markets had an adverse effect on the sales of these products and ultimately on the Company’s profitability. While this market has recovered to historically high levels in fiscal 2011 and 2012, the cyclical nature of the global oil and gas market presents the ongoing possibility of a severe cutback in demand, which would create a significant adverse effect on the sales of these products and ultimately on the Company’s profitability. in the pleasure craft, commercial and military marine markets, as well as in the energy and natural resources, government and industrial markets. The demand for the products may be impacted by the strength of the economy generally, governmental spending and appropriations, including security and defense outlays, fuel prices, interest rates, as well as many other factors. Adverse economic and other conditions may cause the Company's customers to forego or otherwise postpone purchases in favor of repairing existing equipment. In the event of an increase in the global demand for steel, the Company could be adversely affected if it experiences shortages of raw castings and forgings used in the manufacturing of its products. With the continued development of certain developing economies, in particular China and India, the global demand for steel has risen significantly in recent years. The Company selects its suppliers based on a number of criteria, and we expect that they will be able to support our growing needs. However, there can be no assurance that a significant increase in demand, capacity constraints or other issues experienced by the Company’s suppliers will not result in shortages or delays in their supply of raw materials to the Company. If the Company were to experience a significant or prolonged shortage of critical components from any of its suppliers, particularly those who are sole sources, and could not procure the components from other sources, the Company would be unable to meet its production schedules for some of its key products and would miss product delivery dates which would adversely affect our sales, profitability and relationships with our customers. If the Company were to lose business with any key customers, the Company’s business would be adversely affected. Although there were no customers that accounted for 10% or more of consolidated net sales in fiscal 2012, deterioration of a business relationship with one or more of the Company’s significant customers would cause its sales and profitability to be adversely affected. The Company continues to face the prospect of increasing commodity costs, including steel, other raw materials and energy that could have an adverse effect on future profitability. To date, the Company has been successful with offsetting the effects of increased commodity costs through cost reduction programs and pricing actions. However, if material prices were to continue to increase at a rate that could not be recouped through product pricing, it could potentially have an adverse effect on our future profitability. The termination of relationships with the Company’s suppliers, or the inability of such suppliers to perform, could disrupt its business and have an adverse effect on its ability to manufacture and deliver products. The Company relies on raw materials, component parts, and services supplied by outside third parties. If a supplier of significant raw materials, component parts or services were to terminate its relationship with the Company, or otherwise cease supplying raw materials, component parts, or services consistent with past practice, the Company’s ability to meet its obligations to its customers may be affected. Such a disruption with respect to numerous products, or with respect to a few significant products, could have an adverse effect on the Company’s profitability and financial condition. A significant design, manufacturing or supplier quality issue could result in recalls or other actions by the Company that could adversely affect profitability. As a manufacturer of highly engineered products, the performance, reliability and productivity of the Company’s products is one of its competitive advantages. While the Company prides itself on putting in place procedures to ensure the quality and performance of its products and suppliers, a significant quality or product issue, whether due to design, performance, manufacturing or supplier quality issue, could lead to warranty actions, scrapping of raw materials, finished goods or returned products, the deterioration in a customer relation, or other action that could adversely affect warranty and quality costs, future sales and profitability. These factors could adversely affect our business, results of operations or financial condition. A material disruption at the Company’s manufacturing facilities in Racine, Wisconsin could adversely affect its ability to generate sales and meet customer demand. The majority of the Company’s manufacturing, based on fiscal 2012’s sales, came from its two facilities in Racine, Wisconsin. If operations at these facilities were to be disrupted as a result of significant equipment failures, natural disasters, power outages, fires, explosions, adverse weather conditions or other reasons, the Company’s business and results of operations could be adversely affected. Interruptions in production would increase costs and reduce sales. Any interruption in production capability could require the Company to make substantial capital expenditures to remedy the situation, which could negatively affect its profitability and financial condition. The Company maintains property damage insurance which it believes to be adequate to provide for reconstruction of its facilities and equipment, as well as business interruption insurance to mitigate losses resulting from any production interruption or shutdown caused by an insured loss. However, any recovery under this insurance policy may not offset the lost sales or increased costs that may be experienced during the disruption of operations. Lost sales may not be recoverable under the policy and long-term business disruptions could result in a loss of customers. If this were to occur, future sales levels and costs of doing business, and therefore profitability, could be adversely affected. Any failure to meet our debt obligations and satisfy financial covenants could adversely affect our business and financial condition. Beginning in 2008 and continuing into 2010, general worldwide economic conditions experienced a downturn due to the combined effects of the subprime lending crisis, general credit market crisis, collateral effects on the finance and banking industries, slower economic activity, decreased consumer confidence, reduced corporate profits and capital spending, adverse business conditions and liquidity concerns. While some recovery has been seen in 2011and 2012, these conditions made it difficult for customers, vendors and the Company to accurately forecast and plan future business activities, and cause U.S. and foreign businesses to slow spending on products, which delay and lengthen sales cycles. These conditions led to declining revenues in several of the Company’s divisions in fiscal 2009 and 2010. The Company’s amended revolving credit facility and senior notes agreements require it to maintain specified quarterly financial covenants such as a minimum consolidated net worth amount, a minimum EBITDA, as defined, for the most recent four fiscal quarters of $11,000,000 and a funded debt to EBITDA ratio of 3.0 or less. At June 30, 2012, the Company was in compliance with these financial covenants. Based on its annual financial plan, the Company believes that it will generate sufficient EBITDA levels throughout fiscal 2013 in order to maintain compliance with its financial covenants. However, as with all forward-looking information, there can be no assurance that the Company will achieve the planned results in future periods especially due to the significant uncertainties flowing from the current economic environment. If the Company is not able to achieve these objectives and to meet the required covenants under the agreements, the Company may require forbearance from its existing lenders in the form of waivers and/or amendments of its credit facilities or be required to arrange alternative financing. Failure to obtain relief from covenant violations or to obtain alternative financing, if necessary, would have a material adverse impact on the Company. foreign jurisdictions. This review uses historical results, projected future operating results based upon approved business plans, eligible carryforward periods, tax planning opportunities and other relevant considerations. Adverse changes in the profitability and financial outlook in the U.S. or foreign jurisdictions may require the creation of a valuation allowance to reduce our net deferred tax assets. Such changes could result in material non-cash expenses in the period in which the changes are made and could have a material adverse impact on the Company’s results of operations and financial condition. The Company owns two manufacturing, assembly and office facilities in Racine, Wisconsin, U.S.A., one in Nivelles, Belgium, two in Decima, Italy and one in Novazzano, Switzerland. The aggregate floor space of these six plants approximates 847,000 square feet. One of the Racine facilities includes office space, which includes the Company's corporate headquarters. The Company leases additional manufacturing, assembly and office facilities in Italy (Limite sull’Arno) and India (outsourcing office in Chennai). Rock Hill, South Carolina, U.S.A. The Company believes its properties are well maintained and adequate for its present and anticipated needs. Twin Disc is a defendant in several product liability or related claims of which the ultimate outcome and liability to the Company, if any, are not presently determinable. Management believes that the final disposition of such litigation will not have a material impact on the Company’s results of operations, financial position or statement of cash flows. Pursuant to General Instruction G(3) of Form 10-K, the following list is included as an unnumbered Item in Part I of this Report in lieu of being included in the Proxy Statement for the Annual Meeting of Shareholders to be held on October 19, 2012. Officers are elected annually by the Board of Directors at the Board meeting held in conjunction with each Annual Meeting of the Shareholders. Each officer holds office until a successor is duly elected, or until he/she resigns or is removed from office. Michael E. Batten, Chairman and Chief Executive Officer. Mr. Batten has been employed with the Company since 1970, and was named Chairman and Chief Executive Officer in 1991. John H. Batten, President and Chief Operating Officer. Effective July 1, 2008, Mr. Batten was named President and Chief Operating Officer. Prior to this promotion, Mr. Batten served as Executive Vice President since November 2004, Vice President and General Manager – Marine and Propulsion since October 2001 and Commercial Manager – Marine and Propulsion since 1998. Mr. Batten joined Twin Disc in 1996 as an Application Engineer. Mr. Batten is the son of Mr. Michael Batten. Christopher J. Eperjesy, Vice President – Finance, Chief Financial Officer and Treasurer. Mr. Eperjesy joined the Company in his current role in November 2002. Prior to joining Twin Disc, Mr. Eperjesy was Divisional Vice President – Financial Planning & Analysis for Kmart Corporation since 2001, and Senior Manager – Corporate Finance with DaimlerChrysler AG since 1999. James E. Feiertag, Executive Vice President. Mr. Feiertag was appointed to his present position in October 2001. Prior to being promoted, he served as Vice President – Manufacturing since joining the Company in November 2000. Prior to joining Twin Disc, Mr. Feiertag was the Vice President of Manufacturing for the Drives and Systems Group of Rockwell Automation since 1999. Dean J. Bratel, Vice President - Engineering. Mr. Bratel was promoted to his current role in November 2004 after serving as Director of Corporate Engineering (since January 2003), Chief Engineer (since October 2001) and Engineering Manager (since December 1999). Mr. Bratel joined Twin Disc in 1987. Henri Claude Fabry, Vice President – International Distribution. Mr. Fabry was appointed to his current position in January 2009, after serving as Vice President – Global Distribution since 2001. Mr. Fabry joined Twin Disc in 1997 as Director, Marketing and Sales of the Belgian subsidiary. Denise L. Wilcox, Vice President - Human Resources. After joining the Company as Manager Compensation & Benefits in September 1998, Ms. Wilcox was promoted to Director Corporate Human Resources in March 2002 and to her current role in November 2004. Prior to joining Twin Disc, Ms. Wilcox held positions with Johnson International and Runzheimer International. Jeffrey S. Knutson, Corporate Controller. Mr. Knutson was appointed to his current role in October 2005 after joining the Company in February 2005 as Controller of North American Operations. Prior to joining Twin Disc, Mr. Knutson held Operational Controller positions with Tower Automotive (since August 2002) and Rexnord Corporation (since November 1998). Thomas E. Valentyn, General Counsel and Secretary. Mr. Valentyn joined the Company in his current role in September 2007. Prior to joining Twin Disc, Mr. Valentyn served as Vice President and General Counsel at Norlight Telecommunications, Inc. since July 2000. For information regarding the Company’s equity-based compensation plans, see the discussion under Item 12 of this report. As of August 17, 2012, shareholders of record numbered 651. The closing price of Twin Disc common stock as of August 17, 2012 was $19.95. market values, of which 250,000 were purchased during the second quarter of fiscal 2009. An additional 125,000 shares were purchased in open market transactions during the fourth quarter of fiscal 2012. On July 27, 2012, the Board of Directors authorized the purchase of up to an additional 375,000 shares of Common Stock at market values. This authorization has no expiration. The following table compares total shareholder return over the last 5 fiscal years to the Standard & Poor’s 500 Machinery (Industrial) Index and the Russell 2000 index. The S&P 500 Machinery (Industrial) Index consists of a broad range of manufacturers. The Russell 2000 Index consists of a broad range of 2,000 companies. The Company believes, because of the similarity of its business with those companies contained in the S&P 500 Machinery (Industrial) Index, that comparison of shareholder return with this index is appropriate. 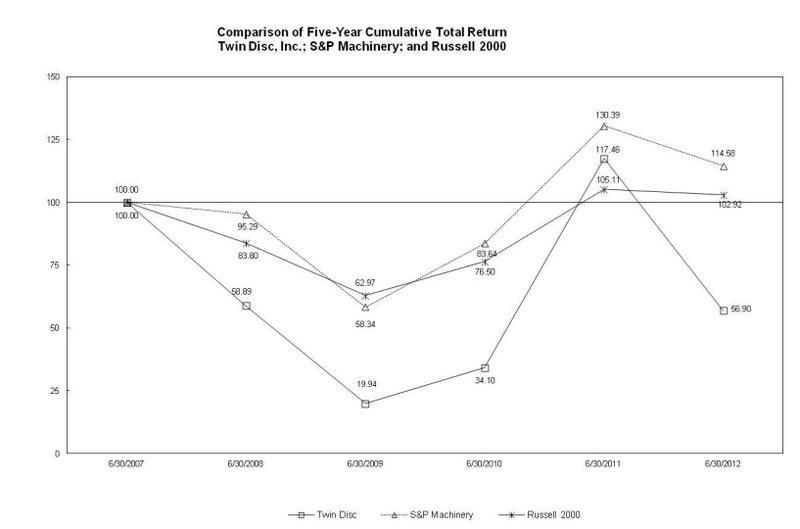 Total return values for the Corporation’s common stock, the S&P 500 Machinery (Industrial) Index and the Russell 2000 Index were calculated based upon an assumption of a $100 investment on June 30, 2007 and based upon cumulative total return values assuming reinvestment of dividends on a quarterly basis. Statements in this report (including but not limited to certain statements in Items 1, 3 and 7) and in other Company communications that are not historical facts are forward-looking statements, which are based on management’s current expectations. These statements involve risks and uncertainties that could cause actual results to differ materially from what appears here. Forward-looking statements include the Company’s description of plans and objectives for future operations and assumptions behind those plans. The words “anticipates,” “believes,” “intends,” “estimates,” and “expects,” or similar anticipatory expressions, usually identify forward-looking statements. In addition, goals established by the Company should not be viewed as guarantees or promises of future performance. There can be no assurance the Company will be successful in achieving its goals. In addition to the assumptions and information referred to specifically in the forward-looking statements, other factors, including, but not limited to those factors discussed under Item 1A, Risk Factors, could cause actual results to be materially different from what is presented in any forward looking statements. * Certain amounts in the fiscal 2011 and 2010 figures have been reclassified to conform to the fiscal 2012 presentation. See Note A for further discussion. Net sales increased $45.5 million, or 14.7%, in fiscal 2012. The year-over-year movement in foreign exchange rates resulted in a net favorable translation effect on sales of $0.4 million in fiscal 2012 compared to fiscal 2011. In fiscal 2012, sales for our worldwide manufacturing operations, before eliminating intra-segment and inter-segment sales, were higher by $57.5 million, or 21.5%, than in the prior fiscal year. Year-over-year changes in foreign exchange rates had a net unfavorable impact on sales of $0.6 million. In fiscal 2012, our domestic manufacturing operation saw continued growth, with a 25.9% increase in sales versus fiscal 2011. The primary driver for this increase was the sale of transmissions and related products for the North American and Asian oil and gas markets as well as increased commercial marine transmission shipments. The Company’s Italian manufacturing operations, which continued to be adversely impacted by the softness in the European mega yacht market in fiscal 2012, experienced a 4.1% decrease in sales compared to the prior fiscal year. The Company’s Belgian manufacturing operation saw a 28.4% increase in sales versus the prior year, although it continued to be adversely impacted by the softness in the global mega yacht market. The Company’s Swiss manufacturing operation, which supplies customized propellers for the global mega yacht and patrol boat markets, experienced a 10.7% decrease in sales compared to the prior fiscal year, primarily due to the impact of continued softness in the global mega yacht market as well as the timing of shipments for the patrol boat market. Our distribution segment, buoyed by strong demand in Asia and the global oil and gas markets, experienced a slight increase of $0.9 million, or 0.7%, in sales in fiscal 2012 compared to fiscal 2011’s record results. Compared to fiscal 2011, on average, the Asian currencies strengthened against the U.S. Dollar. The net translation effect of this on foreign distribution operations was to increase revenues for the distribution segment by approximately $1.5 million versus the prior year, before eliminations. The Company’s distribution operations in Singapore continued to experience strong demand for marine transmission products for use in various commercial applications as well as growing demand in the Asia pressure pumping market. This operation saw a 3.2% increase in sales versus the same period a year ago, and set a new sales record. The Company’s distribution operation in the Northwest of the United States and Southwest of Canada experienced a 1% decline from fiscal 2011’s record levels, and continued to benefit from the strength in the Canadian oil and gas market through most of fiscal 2012. The Company’s distribution operation in Italy, which provides boat accessories and propulsion systems for the pleasure craft market, saw an increase in sales of 41.3% after several years of decline due to continued weakness in the Italian mega yacht market. The Company’s distribution operation in Australia, which provides boat accessories, propulsion and marine transmission systems for the pleasure craft market, saw an increase in sales of 6.3%, due to improving market conditions, including sales of components parts for the Company’s new Express Joystick System® that were shipped in fiscal 2012. The Company’s joint venture in Japan, which sells large marine transmissions for commercial applications throughout Asia, experienced a decrease of nearly 25% in sales in fiscal 2012 compared to fiscal 2011. As reported in the Company’s second fiscal quarter’s results, this decrease was primarily a result of the impact of the Japanese tsunami on this operation, as our joint venture partner’s production facility was impacted by power shortages as well as delayed shipments from suppliers. These issues were substantially resolved in the second fiscal quarter. increased sales into the agriculture, mining and general industrial markets, primarily in the North American and Italian markets, as well as increased activity related to oil field markets. Geographically, sales to the U.S. and Canada represented roughly 59% of consolidated sales for fiscal 2012 compared to 55% in fiscal 2011. This growth was primarily driven by the strength of the North American pressure pumping market through the first three fiscal quarters of fiscal 2012 as well as growing demand in the U.S. gulf region for commercial marine transmission systems in the second half of the fiscal year. Fiscal 2012 proved to be a milestone year for our global sales, as Asia became our second largest end market, surpassing Europe. In particular, the Company experienced triple-digit growth in sales to the Chinese market. See Note J for more information on the Company’s business segments and foreign operations. The elimination for net intra-segment and inter-segment sales increased $12.9 million, or 15.1%, from $85.8 million in fiscal 2011 to $98.7 million in fiscal 2012. Year-over-year changes in foreign exchange rates had a net unfavorable impact of $0.5 million on net intra-segment and inter-segment sales. There were a number of factors that impacted the Company’s overall gross margin rate in fiscal 2012. Gross margin for the year was favorably impacted by higher volumes, favorable product mix and lower domestic pension expense, partially offset by higher material costs and surcharges, and unfavorable manufacturing absorption primarily in the fiscal fourth quarter. The Company estimates the net favorable impact of higher volumes on gross margin in fiscal 2012 was approximately $21.7 million. The favorable shift in product mix related to the Company’s oil and gas transmission business had an estimated impact of $2.0 million. Domestic pension expense included in cost of goods sold decreased from $1.9 million in fiscal 2011 to $0.2 million in fiscal 2012. In addition, warranty expense as a percentage of sales decreased from 1.27% in fiscal 2011 to 1.02% in fiscal 2012 (for additional information on the Company’s warranty expense, see Note F of the Notes to the Consolidated Financial Statements). The decrease in warranty expense as a percentage of sales can be attributed to an increase in volume and an overall reduction in specific warranty campaigns. In addition, the year-over-year movement in foreign exchange rates, primarily driven by movements in the Euro and Asian currencies, resulted in a net favorable translation effect on gross profit of $0.8 million in fiscal 2012 compared to fiscal 2011. The net remaining increase in ME&A expenses for the year of $4.4 million was primarily driven by wage inflation and additional headcount, higher benefit costs, increased travel, higher project related expenses and a continued emphasis on the Company’s product development program. The Company conducted its annual assessment for goodwill impairment in the fourth quarter of fiscal 2012 by applying a fair value based test using discounted cash flow analyses, in accordance with ASC 350-10, “Intangibles – Goodwill and Other.” The result of this assessment identified that one of the Company’s reporting units goodwill was fully impaired, necessitating a charge of $3.7 million. The impairment was due to a declining outlook in the global pleasure craft/megayacht market, the continued weakened European economy and few signs of significant near-term recovery in the markets served by this reporting unit. These factors were identified as the Company conducted its annual budget review process during the fourth fiscal quarter, and the Company concluded that the impairment charge was necessary in connection with the preparation of the year end financial statements during the fourth fiscal quarter. This impairment charge was not deductible for tax purposes. The fair value of the goodwill for the remaining reporting units exceeds the respective carrying values. Interest expense decreased by $0.2 million, or 14.2%, in fiscal 2012. Total interest on the Company’s $40 million revolving credit facility (“revolver”) remained relatively flat at $0.4 million in fiscal 2012. The average borrowing on the revolver, computed monthly, increased to $20.4 million in fiscal 2012, compared to $9.9 million in fiscal 2011. In fiscal 2011, the interest rate on the revolver remained flat at 4.00%, the rate floor, for the first eleven months of the fiscal year. In the fourth fiscal quarter of fiscal 2011, the Company entered into an amended revolver agreement that eliminated the rate floor. As of June 30, 2012, the rate on the revolver was 1.74%. Interest expense for the Company’s $25 million Senior Notes, which carry a fixed interest rate of 6.05%, decreased by $0.2 million to $1.0 million in fiscal 2012 due to a lower average outstanding balance during the fiscal year. For the fiscal 2012 full year, Other, net improved by $2.3 million to a current year income due primarily to favorable exchange movements relative to the Euro, Swiss Franc, Canadian Dollar and Japanese Yen. deductible impairment charge of $3.7 million, which increased the effective rate by approximately 32 percentage points. The remaining rate increase was due to a combination of reduced foreign tax credits, elimination of the R&D tax credit and additional impact of the valuation allowance related to the Company’s Belgian facility. The effective tax rate for fiscal 2012 was 41.2 percent, slightly higher than the prior year rate of 40.8 percent. The Company maintains valuation allowances when it is more likely than not that all or a portion of a deferred tax asset will not be realized. Changes in valuation allowances from period to period are included in the tax provision in the period of change. In determining whether a valuation allowance is required, the Company takes into account such factors as prior earnings history, expected future earnings, carry-back and carry-forward periods, and tax strategies that could potentially enhance the likelihood of realization of a deferred tax asset. During fiscal 2012, the Company continued to incur operating losses in certain foreign jurisdictions where the loss carryforward period is unlimited. The Company has evaluated the realizability of the net deferred tax assets related to these jurisdictions and concluded that based primarily upon continuing losses in these jurisdictions and failure to achieve targeted levels of improvement, a full valuation allowance continues to be necessary. Therefore, the Company recorded an additional valuation allowance of $1.1 million. Management believes that it is more likely than not that the results of future operations will generate sufficient taxable income and foreign source income to realize the remaining deferred tax assets. As of June 30, 2012, the Company’s backlog of orders scheduled for shipment during the next six months (six-month backlog) was $98.7 million, or approximately 33% lower than the six-month backlog of $146.9 million as of June 30, 2011. The decrease in backlog is primarily a result of decreased orders by North American oil and gas customers for the Company’s 8500 series transmission as rig operators adjust to the natural gas supply overhang and lower prices. In fiscal 2012, the Company began to accept orders and ship units of its new 7500 series transmission for the oil and gas market. Partially offsetting the slowdown in the North American pressure pumping market, the Company saw modest growth in the six-month backlog for commercial marine transmissions for both the U.S. Gulf Region and Asia. Net sales increased $82.9 million, or 36.4%, in fiscal 2011. The year-over-year movement in foreign exchange rates resulted in a net favorable translation effect on sales of $3.2 million in fiscal 2011 compared to fiscal 2010.
yacht and patrol boat markets, experienced a 10.1% increase in sales compared to the prior fiscal year, primarily due to the impact of the strengthening Swiss Franc compared to the US Dollar. Our distribution segment, buoyed by continued growth in Asia and the North American oil and gas markets, experienced an increase of $27.2 million, or 26.9%, in sales in fiscal 2011 compared to fiscal 2010. Compared to fiscal 2010, on average, the Asian currencies strengthened against the U.S. Dollar. The net translation effect of this on foreign distribution operations was to increase revenues for the distribution segment by approximately $7.8 million versus the prior year, before eliminations. The Company’s distribution operations in Singapore continued to experience strong demand for marine transmission products for use in various commercial applications. This operation saw a 7.6% increase in sales versus the same period a year ago, and set a new sales record. The Company’s distribution operation in the Northwest of the United States and Southwest of Canada experienced nearly a tripling of its sales due to strength in the Canadian oil and gas market. The Company’s distribution operation in Italy, which provides boat accessories and propulsion systems for the pleasure craft market, saw a decrease in sales of 23.6% due to continued weakness in the Italian mega yacht market. The Company’s distribution operation in Australia, which provides boat accessories, propulsion and marine transmission systems for the pleasure craft market, saw an increase in sales of 26.1%, due to improving market conditions, including sales of components parts for the Company’s new Express Joystick System® that were shipped in fiscal 2011. Net sales for the Company’s largest product market, marine transmission and propulsion systems, were up 9% compared to the prior fiscal year. Sales of the Company’s boat management systems manufactured at our Italian operation and servicing the global mega yacht market, were up approximately 12% versus the prior fiscal year. The Company saw modest recovery across most of the marine product markets it serves. In the off-highway transmission market, the year-over-year increase of just over 124% can be attributed primarily to increased sales of the 8500 series transmission system for the oil and gas markets. Sales of transmission systems for the military market were up slightly over the prior fiscal year. Vehicular transmissions for the airport rescue and fire fighting (ARFF) and agricultural tractor markets were down versus fiscal 2010, however, the year-end backlog was up versus the prior fiscal year end. The increase experienced in the Company’s industrial products of roughly 10% was due to increased sales into the agriculture, mining and general industrial markets, primarily in the North American and Italian markets, as well as increased activity related to oil field markets. The elimination for net intra-segment and inter-segment sales increased $28.6 million, or 50.1%, from $57.2 million in fiscal 2010 to $85.8 million in fiscal 2011. Year-over-year changes in foreign exchange rates had a net unfavorable impact of $5.2 million on net intra-segment and inter-segment sales. for the year was favorably impacted by higher volumes, improved product mix, the absence of extended shutdowns in the first half of the fiscal year at the Company’s domestic and European manufacturing operations, which occurred in fiscal 2010, and a decrease in expenses related to the Company’s defined benefit plans. In addition, warranty expense as a percentage of sales decreased from 1.63%, or $3.7 million, in fiscal 2010 to 1.27%, or $3.9 million, in fiscal 2011 (for additional information on the Company’s warranty expense, see Note F of the Notes to the Consolidated Financial Statements). The Company estimates the net favorable impact of higher volumes on gross margin in fiscal 2011 was approximately $36 million. The favorable shift in product mix related to the Company’s oil and gas transmission business had an estimated impact of $7 million. The decrease in warranty expense as a percentage of sales can be attributed to an increase in volume and an overall reduction in specific warranty campaigns that were experienced in fiscal 2010. In addition, the year-over-year movement in foreign exchange rates, primarily driven by movements in the Euro and Asian currencies, resulted in a net favorable translation effect on gross profit of $1.9 million in fiscal 2011 compared to fiscal 2010. Partially offsetting the above favorable items, the Company reinstituted its annual incentive plan in fiscal 2011. Approximately $1.5 million of the expense associated with the plan was recorded in cost of goods sold in fiscal 2011 compared to $0 in fiscal 2010. The net remaining increase in ME&A expenses for the year of $4,207,000 was primarily driven by the restoration of salary and wage reductions effected in fiscal 2010, higher benefit costs, increased travel, higher project related expenses and a continued emphasis on the Company’s product development program. As announced in June 2009, the Company implemented various measures which included a reduction of annual base salaries of the Company’s salaried employees including all executive officers, removal of the fiscal 2010 bonus/incentive plan, changes to several benefit programs, an across-the-board reduction of marketing, advertising, travel and entertainment expenses, and staff reductions and layoffs. The significant increase in stock-based compensation versus the prior year ($5,641,000) was driven by the accrual for performance-based awards granted in fiscal 2011, a catch-up accrual for performance-based awards granted in fiscal 2010 and the impact of the significant increase in the Company’s stock price (+340%) on the cash-based performance stock unit awards. The Company began accruing the performance-based awards granted in fiscal 2009 and 2010 at the maximum payout level in fiscal 2011 due to the strong improvement in operating results. No accrual was recorded for performance awards in fiscal 2010 due to the shortfall against performance targets, resulting in the required “catch-up” accrual for the fiscal 2010 awards. For additional information on the Company’s stock-based compensation, see Note K of the Notes to the Consolidated Financial Statements. a workforce reduction at its Racine, Canadian and Australian operations. The charge consisted of severance costs for 22 salaried employees and voluntary early retirement charges for an additional 16 manufacturing employees. During fiscal 2009, the Company made cash payments of $180,000, resulting in an accrual balance at June 30, 2009 of $767,000. The remainder of this balance was paid during fiscal 2010, resulting in no accrual balance at June 30, 2010 or 2011. During the fourth quarter of fiscal 2007, the Company recorded a pre-tax restructuring charge of $2,652,000 related to a workforce reduction at its Belgian operation that will allow for improved profitability through targeted outsourcing savings and additional focus on core manufacturing processes. The charge consisted of prepension costs for 32 employees: 29 manufacturing employees and 3 salaried employees. This charge was adjusted in the fourth quarter of fiscal 2008, resulting in a pre-tax benefit of $373,000, due to final negotiations primarily related to notice period pay. Further adjustments were made in the fourth quarter of fiscal 2009 (resulting in a pre-tax expense of $240,000 related to legally required inflationary adjustments to benefits) and fiscal 2010 (resulting in a pre-tax expense of $342,000 primarily related to a Belgian legislation change surrounding the prepension costs and legally required inflationary adjustments). An additional adjustment was made during the fourth quarter of fiscal 2011, resulting in pre-tax expense of $187,000 related to the annual legally required inflationary adjustments to benefits. During fiscal 2011 and 2010, the Company made cash payments of $252,000 and $152,000, respectively. The exchange impact in fiscal 2011 was to increase the accrual by $413,000. Accrued restructuring costs were $2,663,000 and $2,315,000 at June 30, 2011 and 2010, respectively. The Company recorded a restructuring charge of $2,076,000 in the fourth quarter of fiscal 2005 as the Company restructured its Belgian operation to improve future profitability. The charge consists of prepension costs for 37 employees: 33 manufacturing employees and 4 salaried employees. An adjustment was made in the fourth quarter of fiscal 2010, resulting in a pre-tax expense of $138,000 primarily related to a Belgian legislation change surrounding the prepension costs and legally required inflationary adjustments. An additional adjustment was made in the fourth quarter of fiscal 2011, resulting in pre-tax expense of $58,000 related to the annual legally required inflationary adjustments to benefits. During fiscal 2011 and 2010, the Company made cash payments of $220,000 and $192,000, respectively. The exchange impact in fiscal 2011 was to increase the accrual by $161,000. Accrued restructuring costs were $944,000 and $945,000 at June 30, 2011 and 2010, respectively. Interest expense decreased by $0.5 million, or 24.7%, in fiscal 2011. Total interest on the Company’s $40 million revolving credit facility (“revolver”) decreased $0.2 million from $0.6 million in fiscal 2010 to $0.4 million in fiscal 2011. This decrease can be attributed to an overall decrease in the average borrowings year-over-year. The average borrowing on the revolver, computed monthly, decreased to $9.9 million in fiscal 2011, compared to $14.4 million in fiscal 2010. The interest rate on the revolver remained flat at 4.00%, the rate floor, for the first eleven months of the fiscal year. In the fourth fiscal quarter of fiscal 2011, the Company entered into an amended revolver agreement that eliminated the rate floor. As of June 30, 2011, the rate on the revolver was 2.09%. Interest expense for the Company’s $25 million Senior Notes, which carry a fixed interest rate of 6.05%, decreased by $0.2 million to $1.2 million in fiscal 2011.
resulting from the increase in the domestic estimated tax rate from 34.0 percent to 35.0 percent during fiscal 2011. The current year also includes the favorable impact of the reinstatement of the R&D credit, which was passed into law during the second fiscal quarter. The annualized effective rate before 2011 discrete items is 33.3 percent. The prior year rate was relatively high due to the impact of permanent deferred items, which remained relatively constant but had a greater impact on the rate due to the low base of earnings. As of June 30, 2011, the Company’s backlog of orders scheduled for shipment during the next six months (six-month backlog) was $146.9 million, or approximately 74% higher than the six-month backlog of $84.4 million as of June 30, 2010. The improvement in backlog is a result of increased orders by oil and gas customers for the Company’s 8500 series transmission as stable oil and gas prices have driven demand for new high-horsepower rigs. With oil and gas prices remaining firm, the Company is optimistic demand for these transmissions will continue. In addition, the Company has begun to accept orders and has shipped initial units of its new 7500 series transmission for the oil and gas market. In the second half of fiscal 2011, the Company also saw modest growth in the six-month backlog for most of its marine and industrial products. The net cash provided by operating activities in fiscal 2012 totaled $14.4 million, an increase of $0.6 million, or 4%, versus fiscal 2011. The slight increase was driven by a 39% increase in net earnings to $26.1 million largely offset by an increase in working capital. Adjusted for the impact of foreign currency translation, net inventory increased $9.6 million. The majority of the net increase in inventory came at the Company’s North American manufacturing and distribution operations. This increase was driven by strong demand for the Company’s commercial marine transmissions as well as inventory to serve the Company’s North American and Asian oil and gas markets. Net inventory as a percentage of the six-month backlog increased from 67.4% as of June 30, 2011 to 104.5% as of June 30, 2012. The increase in trade accounts receivable was a result of higher sales in the second half of fiscal 2012 compared to the same period in fiscal 2011, $191.6 million versus $173.9 million, respectively. The decrease in trade accounts payable was due to a reduction in purchasing activity related to significant decrease in inventory in the fourth quarter of fiscal 2012 ($14.6 million) compared to an increase in inventory in the fourth quarter of fiscal 2011 ($5.8 million). The net cash provided by operating activities in fiscal 2011 totaled $13.9 million, a decrease of $21.3 million, or 61%, versus fiscal 2010. The net decrease was driven by a net increase in working capital, primarily due to increases in net inventories and trade accounts receivable balances, partially offset by a net increase in trade accounts payable and an increase in net earnings of $18.2 million. The majority of the net increase in inventory came at the Company’s North American manufacturing and distribution operations. This increase was driven by strong demand for the Company’s 8500 series transmission for the oil and gas market as well as a build-up of inventory in anticipation of the demand for the Company’s new 7500 series transmission. Net inventory as a percentage of the six-month backlog decreased from 86.2% as of June 30, 2010 to 67.4% as of June 30, 2011. The increase in trade accounts receivable was a result of higher sales in the second half of fiscal 2011 compared to the same period in fiscal 2010.
of $11.1 million. The net decrease in inventory came primarily at the Company’s European manufacturing locations and its distribution operation in Singapore. The decrease in trade accounts receivable was a result of lower sales in the second half of fiscal 2010 compared to the same period in fiscal 2009 as well as a continued effort to collect outstanding receivables balances globally. The net cash used for investing activities in fiscal 2012 of $13.9 million consisted primarily of capital expenditures for machinery and equipment at our US and Belgian manufacturing operations. In fiscal 2012, the Company spent $13.7 million for capital expenditures, up from $12.0 million and $4.5 million in fiscal years 2011 and 2010, respectively. The net cash used for investing activities in fiscal 2011 of $12.0 million consisted primarily of capital expenditures for machinery and equipment at our US and Belgian manufacturing operations. In fiscal 2011, the Company spent $12.0 million for capital expenditures, up from $4.5 million and $8.9 million in fiscal years 2010 and 2009, respectively. The net cash used for investing activities in fiscal 2010 of $4.6 million consisted primarily of capital expenditures for machinery and equipment at our US and Belgian manufacturing operations, and the continuation of the global implementation of a new ERP system started in fiscal 2007. In fiscal 2010, the Company spent $4.5 million for capital expenditures, down from $8.9 million and $15.0 million in fiscal years 2009 and 2008, respectively. The software costs associated with the new ERP have been substantially paid for and were capitalized in fiscal years 2007 and 2008. In fiscal 2012, the net cash used by financing activities of $3.5 million consisted primarily of the acquisition of treasury stock of $2.4 million, under a Board authorized stock repurchase program, and dividends paid to shareholders of the Company of $3.9 million, partially offset by proceeds from long-term debt of $2.6 million. On February 1, 2008, the Board of Directors authorized the purchase of 500,000 shares of Common Stock at market values. In fiscal 2012, the Company purchased 125,000 shares of its outstanding common stock at an average price of $19.40 per share for a total cost of $2.4 million. In fiscal 2011, the net cash used by financing activities of $4.2 million consisted primarily of payments on long-term debt of $1.4 million and dividends paid to shareholders of the Company of $3.4 million. In fiscal 2010, the net cash used by financing activities of $23.2 million consisted primarily of payments on long-term debt and dividends paid to shareholders of the Company. between 1.5% and 2.5%, depending on the Company’s Total Funded Debt to EBITDA ratio. The rate was 1.74% and 2.09% at June 30, 2012 and 2011, respectively. On April 10, 2006, the Company entered into a Note Agreement (the “Note Agreement”) with The Prudential Insurance Company of America and certain other entities (collectively, “Purchasers”). Pursuant to the Note Agreement, Purchasers acquired, in the aggregate, $25,000,000 in 6.05% Senior Notes due April 10, 2016 (the “Notes”). The Notes mature and become due and payable in full on April 10, 2016 (the “Payment Date”). Prior to the Payment Date, the Company is obligated to make quarterly payments of interest during the term of the Notes, plus prepayments of principal of $3,571,429 on April 10 of each year from 2010 to 2015, inclusive. The outstanding balance was $14,285,714 and $17,857,143 at June 30, 2012 and 2011, respectively. Of the outstanding balance, $3,571,429 was classified as a current maturity of long-term debt at June 30, 2012 and 2011, respectively. The remaining $10,714,286 and $14,285,714 is classified as long-term debt as of June 30, 2012 and 2011, respectively. The Company also has the option of making additional prepayments subject to certain limitations, including the payment of a Yield-Maintenance Amount as defined in the Note Agreement. In addition, the Company will be required to make an offer to purchase the Notes upon a Change of Control, as defined in the Note Agreement, and any such offer must include the payment of a Yield-Maintenance Amount. The Note Agreement includes certain financial covenants which are identical to those associated with the revolving loan agreement discussed above. The Note Agreement also includes certain restrictive covenants that limit, among other things, the incurrence of additional indebtedness and the disposition of assets outside the ordinary course of business. The Note Agreement provides that it shall automatically include any covenants or events of default not previously included in the Note Agreement to the extent such covenants or events of default are granted to any other lender of an amount in excess of $1,000,000. Following an Event of Default, each Purchaser may accelerate all amounts outstanding under the Notes held by such party. “Total funded debt to four quarter EBITDA” is defined as the ratio of total funded debt to four quarter EBITDA calculated in accordance with the above definitions. As of June 30, 2012, the Company was in compliance with all of the covenants described above. As of June 30, 2012, the Company’s backlog of orders scheduled for shipment during the next six months (six-month backlog) was $98.7 million, or approximately 33% lower than the six-month backlog of $146.9 million as of June 30, 2011. In spite of the decrease in order backlog driven primarily by the recent decline in the North American oil and gas market, as rig operators adjust to the natural gas supply overhang and lower prices, the Company does not expect to violate any of its financial covenants in fiscal 2013. The current margin surrounding ongoing compliance with the above covenants, in particular, minimum EBITDA for the most recent four fiscal quarters and total funded debt to EBITDA, are expected to decrease in fiscal 2013. Please see the factors discussed under Item 1A, Risk Factors, of this Form 10-K for further discussion of this topic. The Company’s balance sheet remains very strong, there are no off-balance-sheet arrangements other than the operating leases listed below, and we continue to have sufficient liquidity for near-term needs. The Company had $22.5 million of available borrowings on our $40 million revolving loan agreement as of June 30, 2012, and expects to generate enough cash from operations to meet our operating and investing needs. For the years ended June 30, 2012 and June 30, 2011, respectively, the Company generated net cash from operating activities of $14.4 million and $13.9 million, respectively. As of June 30, 2012, the Company also had cash of $15.7 million, primarily at its overseas operations. These funds, with some restrictions, are available for repatriation as deemed necessary by the Company. In fiscal 2013, the Company expects to contribute $6.5 million to its defined benefit pension plans, the minimum contributions required. However, if the Company elects to make voluntary contributions in fiscal 2013, it intends to do so using cash from operations and, if necessary, from available borrowings under existing credit facilities. Net working capital increased $19.0 million, or 17.1%, in fiscal 2012, and the current ratio increased from 2.3 at June 30, 2011 to 2.9 at June 30, 2012. The increase in net working capital was primarily driven by an increase in accounts receivable and inventories as a result of a significant increase in sales and orders in fiscal 2012, as well as a decrease in trade accounts payable due to the significant reduction in inventory in the fourth fiscal quarter of 2012. Twin Disc expects capital expenditures to be between $15 and $20 million in fiscal 2013. These anticipated expenditures reflect the Company’s plans to continue investing in modern equipment and facilities, its global sourcing program and new products as well as expanding capacity at facilities around the world. Management believes that available cash, the credit facility, cash generated from future operations, existing lines of credit and potential access to debt markets will be adequate to fund Twin Disc’s capital requirements for the foreseeable future. The Company had no off-balance sheet arrangements, other than operating leases, as of June 30, 2012 and 2011. The table above does not include accrued interest of approximately $230,000 related to the revolving loan borrowing. The table above also does not include tax liabilities for unrecognized tax benefits totaling $560,000, excluding related interest and penalties, as the timing of their resolution cannot be estimated. See Note N of the Consolidated Financial Statements for disclosures surrounding uncertain income tax positions. The Company maintains defined benefit pension plans for some of its operations in the United States and Europe. The Company has established the Pension Committee to oversee the operations and administration of the defined benefit plans. The Company estimates that fiscal 2012 contributions to all defined benefit plans will total $6,479,000. As part of the pension funding provisions contained in the Surface Transportation Extension Act of 2012 passed by Congress in June 2012, Twin Disc, Inc.'s fiscal 2013 pension contributions are projected to be reduced to $4 million from $6 million, pending a final interest rate to be issued by the IRS. The preparation of this Annual Report requires management’s judgment to make estimates and assumptions that affect the reported amounts of assets and liabilities, disclosure of contingent assets and liabilities at the dates of the financial statements, and the reported amounts of revenues and expenses during the reporting period. There can be no assurance that actual results will not differ from those estimates. Twin Disc performs ongoing credit evaluations of our customers and adjusts credit limits based on payment history and the customer’s credit-worthiness as determined by review of current credit information. We continuously monitor collections and payments from our customers and maintain a provision for estimated credit losses based upon our historical experience and any specific customer-collection issues. In addition, senior management reviews the accounts receivable aging on a monthly basis to determine if any receivable balances may be uncollectible. Although our accounts receivable are dispersed among a large customer base, a significant change in the liquidity or financial position of any one of our largest customers could have a material adverse impact on the collectibility of our accounts receivable and future operating results. for all other inventories. Management specifically identifies obsolete products and analyzes historical usage, forecasted production based on future orders, demand forecasts, and economic trends when evaluating the adequacy of the reserve for excess and obsolete inventory. The adjustments to the reserve are estimates that could vary significantly, either favorably or unfavorably, from the actual requirements if future economic conditions, customer demand or competitive conditions differ from expectations. In conformity with U.S. GAAP, goodwill is tested for impairment annually or more frequently if events or changes in circumstances indicate that an impairment might exist. The Company performs impairment reviews for its four reporting units using a fair-value method based on management’s judgments and assumptions or third party valuations. The Company is subject to financial statement risk to the extent the carrying amount of a reporting unit exceeds its fair value. Based upon the goodwill impairment review completed at the end of fiscal 2012, it was determined that the goodwill for one of the Company’s reporting units was fully impaired. The fair value for each of the remaining reporting units at June 30, 2012 significantly exceeded the carrying value and therefore goodwill was not impaired. See Note D for additional discussion of the fiscal 2012 impairment charge. In determining the fair value of our reporting units, management is required to make estimates of future operating results, including growth rates, and a weighted-average cost of capital that reflects current market conditions, among others. Our development of future operating results incorporate management's best estimates of current and future economic and market conditions which are derived from a review of past results, current results and approved business plans. Many of the factors used in assessing fair value are outside the control of management, and these assumptions and estimates can change in future periods. While the Company believes its judgments and assumptions were reasonable, different assumptions, economic factors and/or market indicators could materially change the estimated fair values of the Company’s reporting units and, therefore, impairment charges could be required in the future. Discount Rates – When measuring a possible impairment, future cash flows are discounted at a rate that is consistent with a weighted average cost of capital for a potential market participant. The weighted average cost of capital is an estimate of the overall after-tax rate of return required by equity and debt holders of a business enterprise. Twin Disc engages in extensive product quality programs and processes, including actively monitoring and evaluating the quality of its suppliers. However, its warranty obligation is affected by product failure rates, the extent of the market affected by the failure and the expense involved in satisfactorily addressing the situation. The warranty reserve is established based on our best estimate of the amounts necessary to settle future and existing claims on products sold as of the balance sheet date. When evaluating the adequacy of the reserve for warranty costs, management takes into consideration the term of the warranty coverage, historical claim rates and costs of repair, knowledge of the type and volume of new products and economic trends. While we believe the warranty reserve is adequate and that the judgment applied is appropriate, such amounts estimated to be due and payable in the future could differ materially from what actually transpires. Discount rate – based on the Hewitt Top Quartile Yield Curve at June 30, 2012 as applied to the expected payouts from the pension plans. This yield curve is made up of Corporate Bonds rated AA or better. Expected Return on Plan Assets – based on the expected long-term average rate of return on assets in the pension funds, which is reflective of the current and projected asset mix of the funds and considers historical returns earned on the funds. Compensation Increase – reflect the long-term actual experience, the near-term outlook and assumed inflation. Retirement and Mortality Rates – based upon the Generational Mortality Table for fiscal 2010, 2011 and 2012. Health Care Cost Trend Rates – developed based upon historical cost data, near-term outlook and an assessment of likely long-term trends. Measurements of net periodic benefit cost are based on the assumptions used for the previous year-end measurements of assets and obligations. The Company reviews its actuarial assumptions on an annual basis and makes modifications to the assumptions when appropriate. As required by U.S. GAAP, the effects of the modifications are recorded currently or amortized over future periods. Based on information provided by its independent actuaries and other relevant sources, the Company believes that the assumptions used are reasonable; however, changes in these assumptions could impact the Company’s financial position, results of operations or cash flows. The Company accounts for income taxes in accordance with ASC Topic 740, “Income Taxes.” Deferred tax assets and liabilities are recognized for the future tax consequences attributable to differences between financial statement carrying amounts of existing assets and liabilities and their respective tax bases and operating loss and tax credit carryforwards. Deferred tax assets and liabilities are measured using enacted tax rates expected to apply to taxable income in the years in which those temporary differences are expected to be recovered or settled. The Company maintains valuation allowances when it is more likely than not that all or a portion of a deferred tax asset will not be realized. In determining whether a valuation allowance is required, the Company takes into account such factors as prior earnings history, expected future earnings, carry-back and carry-forward periods, and tax strategies that could potentially enhance the likelihood of realization of a deferred tax asset. During fiscal 2012, the Company concluded that it was more likely than not that certain net deferred tax assets in foreign jurisdictions would not be realized, resulting in the recording of a valuation allowance totaling $3,811,000. In July 2012, the Financial Accounting Standards Board (“FASB”) issued amended guidance that simplifies how entities test indefinite-lived intangible assets other than goodwill for impairment. After an assessment of certain qualitative factors, if it is determined to be more likely than not that an indefinite-lived asset is impaired, entities must perform the quantitative impairment test. Otherwise, the quantitative test is optional. The amended guidance is effective for annual and interim impairment tests performed for fiscal years beginning after September 15, 2012, with early adoption permitted. The adoption of this guidance is not expected to have a material impact on the company’s financial results. In September 2011, the FASB issued a standards update that is intended to simplify how entities test goodwill for impairment. This update permits an entity to first assess qualitative factors to determine whether it is “more likely than not” that the fair value of a reporting unit is less than its carrying amount as a basis for determining whether it is necessary to perform the two-step goodwill impairment test described in Accounting Standards Codification (“ASC”) Topic 350 “Intangibles-Goodwill and Other.” This update is effective for annual and interim goodwill impairment tests performed for fiscal years beginning after December 15, 2011 (the Company’s fiscal 2013). This standards update is not expected to have a material impact on the Company’s financial statements. In June 2011, FASB issued a standards update that will allow an entity the option to present the total of comprehensive income, the components of net income, and the components of other comprehensive income either in a single continuous statement of comprehensive income or in two separate but consecutive statements. This standards update eliminates the option of presenting the components of other comprehensive income as part of the statement of changes in stockholders’ equity. This update is effective for fiscal years, and interim periods within those years, beginning after December 15, 2011 (the Company’s fiscal 2013). This standards update is not expected to have any impact on the Company’s financial statements. In May 2011, the FASB issued a standards update which represents the converged guidance of the FASB and the International Accounting Standards Board (“IASB”) on fair value measurement. This collective effort has resulted in common requirements for measuring fair value and for disclosing information about fair value measurements, including a consistent meaning of the term “fair value.” This update is to be applied prospectively effective for interim and annual periods beginning after December 15, 2011 (the Company’s third fiscal quarter of 2012). This standards update did not have a material impact on the Company’s financial statements. The Company is exposed to market risks from changes in interest rates, commodities and foreign currency exchange rates. To reduce such risks, the Company selectively uses financial instruments and other proactive management techniques. All hedging transactions are authorized and executed pursuant to clearly defined policies and procedures, which prohibit the use of financial instruments for trading or speculative purposes. Discussion of the Company’s accounting policies and further disclosure relating to financial instruments is included in Note A to the consolidated financial statements. Interest rate risk - The Company’s earnings exposure related to adverse movements of interest rates is primarily derived from outstanding floating rate debt instruments that are indexed to the LIBOR interest rate. The Company currently has a $40 million revolving loan agreement, which is due to expire on May 31, 2015. In accordance with the loan agreement as amended, the Company borrows at LIBOR plus an additional “Add-On,” between 1.5% and 2.5%, depending on the Company’s Total Funded Debt to EBITDA ratio. Due to the relative stability of interest rates, the Company did not utilize any financial instruments at June 30, 2012 to manage interest rate risk exposure. A 10 percent increase or decrease in the applicable interest rate would result in a change in pretax interest expense of approximately $31,000. Commodity price risk - The Company is exposed to fluctuation in market prices for such commodities as steel and aluminum. The Company does not utilize commodity price hedges to manage commodity price risk exposure. Direct material cost as a percent of total cost of goods sold was 53.8% for fiscal 2012. U.S. Dollar. Of that total, approximately seventy three percent was denominated in Euros with the balance comprised of Japanese Yen, Swiss Franc and the Australian and Singapore Dollars. The Company does not hedge the translation exposure represented by the net assets of its foreign subsidiaries. Foreign currency translation adjustments are recorded as a component of shareholders’ equity. Forward foreign exchange contracts are used to hedge the currency fluctuations on significant transactions denominated in foreign currencies. Derivative financial instruments - The Company has written policies and procedures that place all financial instruments under the direction of the Company corporate treasury department and restrict derivative transactions to those intended for hedging purposes. The use of financial instruments for trading purposes is prohibited. The Company uses financial instruments to manage the market risk from changes in foreign exchange rates. Periodically, the Company enters into forward exchange contracts to reduce the earnings and cash flow impact of non-functional currency denominated receivables and payables. These contracts are highly effective in hedging the cash flows attributable to changes in currency exchange rates. Gains and losses resulting from these contracts offset the foreign exchange gains or losses on the underlying assets and liabilities being hedged. The maturities of the forward exchange contracts generally coincide with the settlement dates of the related transactions. Gains and losses on these contracts are recorded in Other Income (Expense), net in the Consolidated Statement of Operations and Comprehensive (Loss) Income as the changes in the fair value of the contracts are recognized and generally offset the gains and losses on the hedged items in the same period. The primary currency to which the Company was exposed in fiscal 2012 and 2011 was the Euro. At June 30, 2012 and 2011, the Company had no outstanding forward exchange contracts. See Consolidated Financial Statements and Financial Statement Schedule. As required by Rules 13a-15 and 15d-15 of the Securities Exchange Act of 1934, as of the end of the period covered by this report and under the supervision and with the participation of management, including the Chief Executive Officer and the Chief Financial Officer, the Company has evaluated the effectiveness of the design and operation of its disclosure controls and procedures. Based on such evaluation, the Chief Executive Officer and Chief Financial Officer have concluded that such disclosure controls and procedures are effective to provide reasonable assurance that information required to be disclosed by the Company in the reports it files or submits under the Exchange Act is recorded, processed, summarized and reported within the time periods specified in the Securities and Exchange Commission rules and forms, and to provide reasonable assurance that information required to be disclosed by the Company in the reports it files or submits under the Exchange Act is accumulated and communicated to the Company’s management, including its principal executive and principal financial officers, as appropriate, to allow timely decisions regarding disclosure. provide reasonable assurance regarding prevention or timely detection of unauthorized acquisition, use or disposition of the Company’s assets that could have a material effect on financial statements. Because of its inherent limitations, internal control over financial reporting may not prevent or detect misstatements. Also, projections of any evaluation of the effectiveness to future periods are subject to the risk that controls may become inadequate because of changes in conditions, or that the degree of compliance with the policies and procedures included in such controls may deteriorate. The Company conducted an evaluation of the effectiveness of our internal control over financial reporting based upon the framework in Internal Control – Integrated Framework issued by the Committee of Sponsoring Organizations of the Treadway Commission (COSO). Based upon such evaluation, our management concluded that our internal control over financial reporting was effective as of June 30, 2012. PricewaterhouseCoopers LLP, an independent registered public accounting firm, has audited the Company’s consolidated financial statements included in this annual report and has issued an attestation report on the Company’s internal control over financial reporting. During the fourth quarter of fiscal 2012, there have not been any changes in the Company’s internal control over financial reporting that have materially affected, or are reasonably likely to materially affect, the Company’s internal control over financial reporting. For information with respect to the executive officers of the Registrant, see "Executive Officers of the Registrant" at the end of Part I of this report. For information with respect to the Directors of the Registrant, see "Election of Directors" in the Proxy Statement for the Annual Meeting of Shareholders to be held October 19, 2012, which is incorporated into this report by reference. For information with respect to compliance with Section 16(a) of the Securities Exchange Act of 1934, see "Section 16(a) Beneficial Ownership Reporting Compliance" in the Proxy Statement for the Annual Meeting of Shareholders to be held October 19, 2012, which is incorporated into this report by reference. For information with respect to the Company’s Code of Ethics, see "Guidelines for Business Conduct and Ethics” in the Proxy Statement for the Annual Meeting of Shareholders to be held October 19, 2012, which is incorporated into this report by reference. The Company’s Code of Ethics, entitled, “Guidelines for Business Conduct and Ethics,” is included on the Company’s website, www.twindisc.com. For information with respect to procedures by which shareholders may recommend nominees to the Company’s Board of Directors, see “Selection of Nominees for the Board” in the Proxy Statement for the Annual Meeting of Shareholders to be held October 19, 2012, which is incorporated into this report by reference. There were no changes to these procedures since the Company’s last disclosure relating to these procedures. For information with respect to the Audit Committee Financial Expert, see “Director Committee Functions: Audit Committee” in the Proxy Statement for the Annual Meeting of Shareholders to be held October 19, 2012, which is incorporated into this report by reference. For information with respect to the Audit Committee Disclosure, see “Director Committee Functions: Audit Committee” in the Proxy Statement for the Annual Meeting of Shareholders to be held October 19, 2012, which is incorporated into this report by reference. For information with respect to the Audit Committee Membership, see “Director Committee Functions: Committee Membership” in the Proxy Statement for the Annual Meeting of Shareholders to be held October 19, 2012, which is incorporated into this report by reference. The information set forth under the captions "Executive Compensation," "Director Compensation,” “Compensation Committee Interlocks and Insider Participation,” and “Compensation Committee Report,” in the Proxy Statement for the Annual Meeting of Shareholders to be held on October 19, 2012, is incorporated into this report by reference. Discussion in the Proxy Statement under the captions “Compensation Committee Report” is incorporated by reference but shall not be deemed “soliciting material” or to be “filed” as part of this report. Security ownership of certain beneficial owners and management is set forth in the Proxy Statement for the Annual Meeting of Shareholders to be held on October 19, 2012 under the captions "Principal Shareholders” and “Directors and Executive Officers" and incorporated into this report by reference. For information regarding securities authorized for issuance under equity compensation plans of the Company, see “Equity Compensation Plan Information” in the Proxy Statement for the Annual Meeting of Shareholders to be held on October 19, 2012, which incorporated into this report by reference. There are no arrangements known to the Registrant, the operation of which may at a subsequent date result in a change in control of the Registrant. For information with respect to transactions with related persons and policies for the review, approval or ratification of such transactions, see “Corporate Governance – Review, Approval or Ratification of Transactions with Related Persons” in the Proxy Statement for the Annual Meeting of Shareholders to be held October 19, 2012, which is incorporated into this report by reference. For information with respect to director independence, see “Corporate Governance – Board Independence” in the Proxy Statement for the Annual Meeting of Shareholders to be held October 19, 2012, which is incorporated into this report by reference. See “Index to Consolidated Financial Statements and Financial Statement Schedule”, the Report of Independent Registered Public Accounting Firm and the Consolidated Financial Statements, all of which are incorporated by reference. See “Index to Consolidated Financial Statements and Financial Statement Schedule”, and the Consolidated Financial Statement Schedule, all of which are incorporated by reference. (a)(3) Exhibits. See Exhibit Index included as the last page of this form, which is incorporated by reference. Schedules, other than those listed, are omitted for the reason that they are inapplicable, are not required, or the information required is shown in the financial statements or the related notes. In our opinion, the consolidated financial statements listed in the index appearing under Item 15(a)(1) present fairly, in all material respects, the financial position of Twin Disc, Incorporated and its subsidiaries at June 30, 2012 and June 30, 2011, and the results of their operations and their cash flows for each of the three years in the period ended June 30, 2012 in conformity with accounting principles generally accepted in the United Sates of America. In addition, in our opinion, the financial statement schedule listed in the index appearing under Item 15(a)(2) presents fairly, in all material respects, the information set forth therein when read in conjunction with the related consolidated financial statements. Also, in our opinion, the Company maintained, in all material respects, effective internal control over financial reporting as of June 30, 2012, based on criteria established in Internal Control – Integrated Framework issued by the Committee of Sponsoring Organizations of the Treadway Commission (COSO). The Company’s management is responsible for these financial statements and financial statement schedule, for maintaining effective internal control over financial reporting and for its assessment of the effectiveness of internal control over financial reporting, included in Management’s Report on Internal Control Over Financial Reporting appearing under Item 9(a). Our responsibility is to express opinions on these financial statements, on the financial statement schedule, and on the Company’s internal control over financial reporting based on our integrated audits. We conducted our audits in accordance with the standards of the Public Company Accounting Oversight Board (United States). Those standards require that we plan and perform the audits to obtain reasonable assurance about whether the financial statements are free of material misstatement and whether effective internal control over financial reporting was maintained in all material respects. Our audits of the financial statements included examining, on a test basis, evidence supporting the amounts and disclosures in the financial statements, assessing the accounting principles used and significant estimates made by management, and evaluating the overall financial statement presentation. Our audit of internal control over financial reporting included obtaining an understanding of internal control over financial reporting, assessing the risk that a material weakness exists, and testing and evaluating the design and operating effectiveness of internal control based on the assessed risk. Our audits also included performing such other procedures as we considered necessary in the circumstances. We believe that our audits provide a reasonable basis for our opinions. The notes to consolidated financial statements are an integral part of these statements. Consolidation Principles--The consolidated financial statements include the accounts of Twin Disc, Incorporated and its wholly and partially owned domestic and foreign subsidiaries. Certain foreign subsidiaries are included based on fiscal years ending May 31, to facilitate prompt reporting of consolidated accounts. The Company also has a noncontrolling interest in a Japanese joint venture, which is consolidated based upon a fiscal year ending March 31. All significant intercompany transactions have been eliminated. Translation of Foreign Currencies--The financial statements of the Company’s non-U.S. subsidiaries are translated using the current exchange rate for assets and liabilities and the weighted-average exchange rate for the year for revenues and expenses. The resulting translation adjustments are recorded as a component of accumulated other comprehensive income (loss), which is included in equity. Gains and losses from foreign currency transactions are included in earnings. Included in other income (expense) are foreign currency transaction (gains) losses of ($1,103,000), $1,141,000 and ($571,000) in fiscal 2012, 2011 and 2010, respectively. Receivables--Trade accounts receivable are stated net of an allowance for doubtful accounts of $2,194,000 and $2,093,000 at June 30, 2012 and 2011, respectively. The Company records an allowance for doubtful accounts provision for certain customers where a risk of default has been specifically identified as well as provisions determined on a general basis when it is believed that some default is probable and estimable but not yet clearly associated with a specific customer. The assessment of likelihood of customer default is based on a variety of factors, including the length of time the receivables are past due, the historical collection experience and existing economic conditions. Various factors may adversely impact our customer’s ability to access sufficient liquidity and capital to fund their operations and render the Company’s estimation of customer defaults inherently uncertain. While the Company believes current allowances for doubtful accounts are adequate, it is possible that these factors may cause higher levels of customer defaults and bad debt expense in future periods. Fair Value of Financial Instruments--The carrying amount reported in the consolidated balance sheets for cash, trade accounts receivable, accounts payable and short term borrowings approximate fair value because of the immediate short-term maturity of these financial instruments. The fair value of the Company’s 6.05% Senior Notes due April 10, 2016 was approximately $15,768,000 and $19,589,000 at June 30, 2012 and 2011, respectively. The fair value of the Senior Notes is estimated by discounting the future cash flows at rates offered to the Company for similar debt instruments of comparable maturities. This rate was represented by the US Treasury Three-Year Yield Curve Rate (0.41% and 0.81% for fiscal 2012 and 2011, respectively), plus the current add-on related to the Company’s revolving loan agreement (1.50% and 2.00% for fiscal 2012 and 2011, respectively) resulting in a total rate of 1.91% and 2.81% for fiscal 2012 and 2011, respectively. See Note G, “Debt” for the related book value of this debt instrument. The Company’s revolving loan agreement approximates fair value at June 30, 2012. If measured at fair value in the financial statements, long-term debt (including the current portion) would be classified as Level 2 in the fair value hierarchy, as described in Note M.
Derivative Financial Instruments--The Company has written policies and procedures that place all financial instruments under the direction of the Company’s corporate treasury and restricts all derivative transactions to those intended for hedging purposes. The use of financial instruments for trading purposes is prohibited. The Company uses financial instruments to manage the market risk from changes in foreign exchange rates. to which the Company was exposed in fiscal 2012 and 2011 was the Euro. At June 30, 2012 and 2011, the Company had no outstanding forward exchange contracts. Inventories--Inventories are valued at the lower of cost or market. Cost has been determined by the last-in, first-out (LIFO) method for the majority of inventories located in the United States, and by the first-in, first-out (FIFO) method for all other inventories. Management specifically identifies obsolete products and analyzes historical usage, forecasted production based on future orders, demand forecasts, and economic trends, among others, when evaluating the adequacy of the reserve for excess and obsolete inventory. Property, Plant and Equipment and Depreciation--Assets are stated at cost. Expenditures for maintenance, repairs and minor renewals are charged against earnings as incurred. Expenditures for major renewals and betterments are capitalized and depreciated. Depreciation is provided on the straight-line method over the estimated useful lives of the assets for financial reporting and on accelerated methods for income tax purposes. The lives assigned to buildings and related improvements range from 10 to 40 years, and the lives assigned to machinery and equipment range from 5 to 15 years. Upon disposal of property, plant and equipment, the cost of the asset and the related accumulated depreciation are removed from the accounts and the resulting gain or loss is reflected in earnings. Fully depreciated assets are not removed from the accounts until physically disposed. Impairment of Long-lived Assets--The Company reviews long-lived assets for impairment whenever events or changes in business circumstances indicate that the carrying amount of the assets may not be fully recoverable. For property, plant and equipment and other long-lived assets, excluding indefinite-lived intangible assets, the Company performs undiscounted operating cash flow analyses to determine if an impairment exists. If an impairment is determined to exist, any related impairment loss is calculated based on fair value. Revenue Recognition--Revenue is recognized by the Company when all of the following criteria are met: persuasive evidence of an arrangement exists; delivery has occurred and ownership has transferred to the customer; the price to the customer is fixed or determinable; and collectability is reasonably assured. Revenue is recognized at the time product is shipped to the customer, except for certain domestic shipments to overseas customers where revenue is recognized upon receipt by the customer. A significant portion of our consolidated net sales is transacted through a third party distribution network. Sales to third party distributors are subject to the revenue recognition criteria described above. Goods sold to third party distributors are subject to an annual return policy, for which a provision is made at the time of shipment based upon historical experience. Goodwill and Other Intangibles-- Goodwill and other indefinite-lived intangible assets, primarily tradenames, are tested for impairment at least annually on the last day of the Company’s fiscal year and more frequently if an event occurs which indicates the asset may be impaired in accordance with the ASC Topic 350-10, “Intangibles – Goodwill and Other.” If applicable, goodwill and other indefinite-lived intangible assets not subject to amortization have been assigned to reporting units for purposes of impairment testing based upon the relative fair value of the asset to each reporting unit. A significant amount of judgment is involved in determining if an indicator of impairment has occurred. Such indicators may include, among others: a significant decline in expected future cash flows; a sustained, significant decline in the Company’s stock price and market capitalization; a significant adverse change in legal factors or in the business climate; unanticipated competition; the testing for recoverability of a significant asset group within a reporting unit; and slower growth rates. Any adverse change in these factors could have a significant impact on the recoverability of these assets and could have a material impact on the Company’s consolidated financial statements. Impairment of goodwill is measured according to a two step approach. In the first step, the fair value of a reporting unit, as defined, is compared to the carrying value of the reporting unit, including goodwill. The fair value is primarily determined using discounted cash flow analyses; however, other methods may be used to substantiate the discounted cash flow analyses, including third party valuations when necessary. For purposes of the June 30, 2012 impairment analysis, the Company has utilized discounted cash flow analyses. If the carrying amount exceeds the fair value, the second step of the goodwill impairment test is performed to measure the amount of the impairment loss, if any. In the second step, the implied value of the goodwill is estimated as the fair value of the reporting unit less the fair value of all other tangible and identifiable intangible assets of the reporting unit. If the carrying amount of the goodwill exceeds the implied fair value of the goodwill, an impairment loss is recognized in an amount equal to that excess, not to exceed the carrying amount of the goodwill. Based upon the goodwill impairment review completed in conjunction with the preparation of the annual financial statements at the end of fiscal 2012, which incorporates management’s best estimates of economic and market conditions over the projected period and a weighted-average cost of capital that reflects current market conditions, it was determined that the goodwill for one of the Company’s reporting units was fully impaired. The fair value of goodwill for each of the remaining reporting units exceeded the carrying value and therefore goodwill was not impaired. See Note D for additional discussion of the fiscal 2012 impairment charge. The fair value of the Company’s other intangible assets with indefinite lives, primarily tradenames, is estimated using the relief-from-royalty method, which requires assumptions related to projected revenues; assumed royalty rates that could be payable if the Company did not own the asset; and a discount rate. The Company completed the impairment testing of indefinite-lived intangibles as of June 30, 2012 and concluded there were no impairments. Changes in circumstances, existing at the measurement date or at other times in the future, or in the numerous estimates associated with management’s judgments, assumptions and estimates made in assessing the fair value of goodwill and other intangibles, could result in an impairment charge in the future. The Company will continue to monitor all significant estimates and impairment indicators, and will perform interim impairment reviews as necessary. Deferred Taxes--The Company recognizes deferred tax liabilities and assets for the expected future income tax consequences of events that have been recognized in the Company’s financial statements. Under this method, deferred tax liabilities and assets are determined based on the temporary differences between the financial statement carrying amounts and the tax bases of assets and liabilities using enacted tax rates in effect in the years in which temporary differences are expected to reverse. Valuation allowances are provided for deferred tax assets where it is considered more likely than not that the Company will not realize the benefit of such assets. Management Estimates--The preparation of financial statements in conformity with generally accepted accounting principles requires management to make estimates and assumptions that affect the reported amounts of assets and liabilities and disclosure of contingent liabilities at the dates of the financial statements and the reported amounts of revenues and expenses during the reporting periods. Actual amounts could differ from those estimates. Shipping and Handling Fees and Costs--The Company records revenue from shipping and handling costs in net sales. The cost associated with shipping and handling of products is reflected in cost of goods sold. Reclassification--Certain amounts in the 2011 and 2010 consolidated statements of operations have been reclassified to conform to the presentation in the fiscal 2012 financial statements. Specifically, the amounts identified as restructuring for the years ended June 30, 2011 and 2010 ($254,000 and $494,000, respectively) have been reclassified into the Marketing, engineering and administrative expenses line item. These same amounts were reclassified from the Restructuring of operations line to the Accrued liabilities line within the operating section of the consolidated statement of cash flows. In addition, $2,419,000 has been reclassified from the current portion of Deferred income taxes to Other current assets on the fiscal 2011 consolidated balance sheets. Finally, the amounts classified as Excess tax benefits from stock compensation on the consolidated statement of cash flows for fiscal 2011 and 2010 ($317,000 and ($131,000), respectively) have been reclassified from Other financing activities. beginning after December 15, 2011 (the Company’s fiscal 2013). This standards update is not expected to have a material impact on the Company’s financial statements. Inventories stated on a LIFO basis represent approximately 33% and 32% of total inventories at June 30, 2012 and 2011, respectively. The approximate current cost of the LIFO inventories exceeded the LIFO cost by $23,970,000 and $23,020,000 at June 30, 2012 and 2011, respectively. The Company reserves for inventory obsolescence of $6,728,000 and $6,219,000 at June 30, 2012 and 2011, respectively. Depreciation expense for the years ended June 30, 2012, 2011 and 2010 was $9,947,000, $9,110,000 and $9,021,000, respectively. The Company conducted its annual assessment for goodwill impairment in the fourth quarter of fiscal 2012 by applying a fair value based test using discounted cash flow analyses, in accordance with ASC 350-10, “Intangibles – Goodwill and Other.” The result of this assessment identified that one of the Company’s reporting units goodwill was fully impaired, necessitating a non-cash charge of $3,670,000. The impairment was due to a declining outlook in the global pleasure craft/megayacht market, the weakened European economy, few signs of significant near-term recovery in the markets served by this reporting unit and the heightened economic risk profile of this Italian reporting unit as of June 30, 2012. These factors were identified as the Company conducted its annual budget review process during the fourth fiscal quarter, and the Company concluded that the impairment charge was necessary in connection with the preparation of the year end financial statements. The fair value of the goodwill for the remaining reporting units exceeds the respective carrying values. The weighted average remaining useful life of the intangible assets included in the table above is approximately 6 years. The gross carrying amount of the Company’s intangible assets that have indefinite lives and are not subject to amortization as of June 30, 2012 and 2011 are $2,054,000 and $2,340,000, respectively. These assets are comprised of acquired tradenames. The current portion of the warranty accrual ($3,764,000 and $4,503,000 for fiscal 2012 and 2011, respectively) is reflected in accrued liabilities, while the long-term portion ($1,981,000 and $1,519,000 for fiscal 2012 and 2011, respectively) is included in other long-term liabilities on the Consolidated Balance Sheets. The Company has a revolving loan agreement with M&I Marshall & Ilsley Bank (“M&I”). During the fourth quarter of fiscal 2011, the total commitment was increased to $40,000,000 from $35,000,000 and the term was extended to May 31, 2015. The outstanding balance of $17,550,000 and $11,300,000 at June 30, 2012 and 2011, respectively, is classified as long-term debt. In accordance with the loan agreement, as amended, the Company can borrow at LIBOR plus an additional “Add-On,” between 1.5% and 2.5%, depending on the Company’s total funded debt to EBITDA ratio. The rate was 1.74% and 2.09% at June 30, 2012 and 2011, respectively. This agreement contains certain covenants, including restrictions on investments, acquisitions and indebtedness. Financial covenants include a minimum consolidated net worth amount, as defined, a minimum EBITDA for the most recent four fiscal quarters, and a maximum total funded debt to EBITDA ratio. As of June 30, 2012, the Company was in compliance with these covenants. Based on its annual financial plan, the Company believes it is well positioned to generate sufficient EBITDA levels throughout fiscal 2013 in order to maintain compliance with the above covenants. However, as with all forward-looking information, there can be no assurance that the Company will achieve the planned results in future periods due to the uncertainties in certain of its markets. On April 10, 2006, the Company entered into a Note Agreement (the “Note Agreement”) with The Prudential Insurance Company of America and certain other entities (collectively, “Purchasers”). Pursuant to the Note Agreement, Purchasers acquired, in the aggregate, $25,000,000 in 6.05% Senior Notes due April 10, 2016 (the “Notes”). The Notes mature and become due and payable in full on April 10, 2016 (the “Payment Date”). Prior to the Payment Date, the Company is obligated to make quarterly payments of interest during the term of the Notes, plus prepayments of principal of $3,571,429 on April 10 of each year from 2010 to 2015, inclusive. The Company also has the option of making additional prepayments subject to certain limitations, including the payment of a Yield-Maintenance Amount as defined in the Note Agreement. In addition, the Company will be required to make an offer to purchase the Notes upon a Change of Control, as defined in the Note Agreement, and any such offer must include the payment of a Yield-Maintenance Amount. The Note Agreement includes certain financial covenants which are identical to those associated with the revolving loan agreement discussed above. The Note Agreement also includes certain restrictive covenants that limit, among other things, the incurrence of additional indebtedness and the disposition of assets outside the ordinary course of business. The Note Agreement provides that it shall automatically include any covenants or events of default not previously included in the Note Agreement to the extent such covenants or events of default are granted to any other lender of an amount in excess of $1,000,000. Following an Event of Default, each Purchaser may accelerate all amounts outstanding under the Notes held by such party. As of June 30, 2012, the Company was in compliance with these covenants. Total rent expense for operating leases approximated $3,657,000, $4,103,000 and $3,989,000 in fiscal 2012, 2011 and 2010, respectively. The total number of shares of common stock outstanding at June 30, 2012, 2011 and 2010 was 11,304,487, 11,359,894 and 11,198,226, respectively. At June 30, 2012 and 2011, treasury stock consisted of 1,794,981 and 1,739,574 shares of common stock, respectively. The Company issued 69,593 and 161,668 shares of treasury stock in fiscal 2012 and 2011, respectively, to fulfill its obligations under the stock option plans and restricted stock grants. The difference between the cost of treasury shares and the option price is recorded in common stock. On February 1, 2008, the Board of Directors authorized the purchase of 500,000 shares of Common Stock at market values. In fiscal 2012, the Company purchased 125,000 shares of its outstanding common stock at an average price of $19.40 per share for a total cost of $2,425,000. In fiscal 2009, the Company purchased 250,000 shares of its outstanding common stock at an average price of $7.25 per share for a total cost of $1,812,500. On July 27, 2012, the Board of Directors authorized the purchase of an additional 375,000 shares of Common Stock at market values. This authorization has no expiration. Cash dividends per share were $0.34, $0.30 and $0.28 in fiscal 2012, 2011 and 2010, respectively. Effective June 30, 2008, the Company’s Board of Directors established a Shareholder Rights Plan and distributed to shareholders one preferred stock purchase right (a “Right’) for each outstanding share of common stock. This Shareholder Rights Plan was amended on May 1, 2012. Under certain circumstances, a Right can be exercised to purchase one four-hundredth of a share of Series A Junior Preferred Stock at an exercise price of $125, subject to certain anti-dilution adjustments. The Rights will become exercisable on the earlier of: (i) ten business days following a public announcement that a person or group of affiliated or associated persons (an “Acquiring Person”) has acquired, or obtained the right to acquire from shareholders, beneficial ownership of 20% or more of the outstanding Company’s common stock (or 30% or more in the case of any person or group which currently owns 20% or more of the shares or who shall become the beneficial owner of 20% or more of the shares as a result of any transfer by reason of the death of or by gift from any other person who is an affiliate or an associate of such existing holder or by succeeding such a person as trustee of a trust existing on the Record Date ("Existing Holder")) or (ii) ten business days following the commencement of a tender offer or exchange offer that would result in a person or group beneficially owning 20% or more of such outstanding Common Stock (or 30% or more for an Existing Holder), as such periods may be extended pursuant to the Rights Agreement. In the event that any person or group becomes an Acquiring Person, each holder of a Right shall thereafter have the right to receive, upon exercise, in lieu of Preferred Stock, common stock of the Company having a value equal to two times the exercise price of the Right. However, Rights are not exercisable as described in this paragraph until such time as the Rights are no longer redeemable by the Company as set forth below. Notwithstanding any of the foregoing, if any person becomes an Acquiring Person all Rights that are, or (under certain circumstances specified in the Rights Agreement) were, beneficially owned by an Acquiring Person will become null and void. redemption of the Rights, the Rights will terminate and the only right of the holders of Rights will be to receive the $.01 redemption price. The Company is authorized to issue 200,000 shares of preferred stock, none of which have been issued. The Company has designated 150,000 shares of the preferred stock for the purpose of the Shareholder Rights Plan. The Company and its subsidiaries are engaged in the manufacture and sale of marine and heavy duty off-highway power transmission equipment. Principal products include marine transmissions, surface drives, propellers and boat management systems, as well as power-shift transmissions, hydraulic torque converters, power take-offs, industrial clutches and controls systems. The Company sells to both domestic and foreign customers in a variety of market areas, principally pleasure craft, commercial and military marine markets, as well as in the energy and natural resources, government and industrial markets. The Company has two reportable segments: manufacturing and distribution. These segments are managed separately because each provides different services and requires different technology and marketing strategies. The accounting practices of the segments are the same as those described in the summary of significant accounting policies. Transfers among segments are at established inter-company selling prices. Management evaluates the performance of its segments based on net earnings. All adjustments represent inter-company eliminations and corporate amounts. Net sales by geographic region are based on product shipment destination. There were no customers that accounted for 10% or more of consolidated net sales in fiscal 2012, 2011 or fiscal 2010. During fiscal 2011, the Company adopted the Twin Disc, Incorporated 2010 Stock Incentive Plan for Non-Employee Directors (the “Directors’ Plan”), a plan to grant non-employee directors equity based awards up to 250,000 shares of common stock, and the Twin Disc, Incorporated 2010 Long-Term Incentive Compensation Plan (the “Incentive Plan”), a plan under which officers and key employees may be granted equity based awards up to 650,000 shares of common stock. The Directors’ Plan may grant options to purchase shares of common stock, at the discretion of the board, to non-employee directors who are elected or reelected to the board, or who continue to serve on the board. Such options carry an exercise price equal to the fair market value of the Company’s common stock as of the date of grant, vest immediately, and expire ten years after the date of grant. Options granted under the Incentive Plan are determined to be non-qualified or incentive stock options as of the date of grant, and may carry a vesting schedule. For options under the Incentive Plan that are intended to qualify as incentive stock options, if the optionee owns more than 10% of the total combined voting power of the Company’s stock, the price will not be less than 110% of the grant date fair market value and the options expire five years after the date of grant. There were no incentive options granted to a greater than 10% shareholder during the years presented. There were no options outstanding under the Directors’ Plan and the Incentive Plan as of June 30, 2012 and 2011. The Company has 21,600 non-qualified stock options outstanding as of June 30, 2012 under the Twin Disc, Incorporated Plan for Non-Employee Directors and Twin Disc, Incorporated 2004 Stock Incentive Plan. The 2004 plans were terminated during 2010, except options then outstanding will remain so until exercised or until they expire. The Company has 44,000 non-qualified stock options outstanding at June 30, 2012 under the Twin Disc, Incorporated 1998 Incentive Compensation plan and the 1998 Stock Option Plan for Non-employee Directors. The 1998 plans were terminated during 2004, except that options then outstanding will remain so until exercised or until they expire.